I love acorn squash. It has just a bit of sweetness. That sweetness makes it a perfect match for the apples found in this novel recipe. Add a bit of brown sugar and some nutmeg or cinnamon. Voila, now you have a wonderful cool weather vegetable side dish recipe that even picky eaters will probably love. Cut the squash in half and remove the seeds. Place, cut side down, in a shallow greased baking dish. Add 1/2 cup (125 ml) of water and cover. Bake in the preheated oven for 10 minutes. Remove from the oven. Turn squash cut side up and sprinkle it with salt. Fill the squash with apples and dot generously with butter. 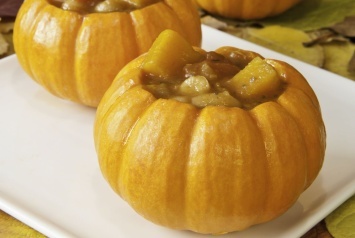 Sprinkle each squash half with 1 tablespoon of brown sugar, then with a little nutmeg or cinnamon (or a combination). Pour 1/2 cup of boiling water into the baking dish. Bake for 30 minutes or until the squash and apples are tender. Optional: Top the squash with sliced or slivered toasted almonds for serving. You can use a variety of squash for this recipe. The one used in the image above is a flatter bottom squash, so instead of cutting it in half and cooking the halves, you can slice off the top, scoop out the inside, turn it over to bake and then fill the whole small squash. It makes a wonderful presentation. You can also add a few raisins to the apple mixture if you want. Tastes great. To make this recipe even healthier, replace half of the brown sugar with a natural sugar-free sweetener like Stevia. You won’t need anywhere near the same amount of stevia as it is quite sweet, so check your package to see what the exchange amount is. And do use the toasted almonds in the recipe for added nutrition. If you like this acorn squash recipe, you may want to try our sunshine butternut squash recipe too. Find it here.